Out of all the caterpillars I released outside, only two (yes, TWO) survived to spin a cocoon. Technically, they are now pupae (for a nice explanation of what this means, check here). They are out in the lilac shrub and I hope they survive to emerge in the spring. However, I am finding out that almost everything eats them (squirrels, woodpeckers, etc…) at their various life stages, so keep your fingers crossed. OK, so the yellow jackets were eating the caterpillars I released and I finally broke down and pulled as many I as could back inside. While not all of them successfully spun their cocoons (some of the late bloomers just keeled over), most of the caterpillars got busy and made fairly large orange ones. You could tell when one was getting ready to spin, as it would stop eating and wander around looking for that perfect spot to spend the winter. And they are surprisingly picky! It probably didn’t help that there were so many of them in one cage, as I would guess it might be instinctual to spread out and pupate. Also, right before they started to produce the silk, they…er…well…evacuated a lot of “liquid” from their bodies. I have no idea if this is just extra water, extra leaf residue or some sort of internal chemical change discharge. Whatever it is, it really, really stinks. Phew! For a few weeks after they make their cocoons, you can hear the pupa moving around. It’s kind of cool to hear this small rustling every so often. Right now, though, they are firmly in their forms and dormant for the rest of this winter. 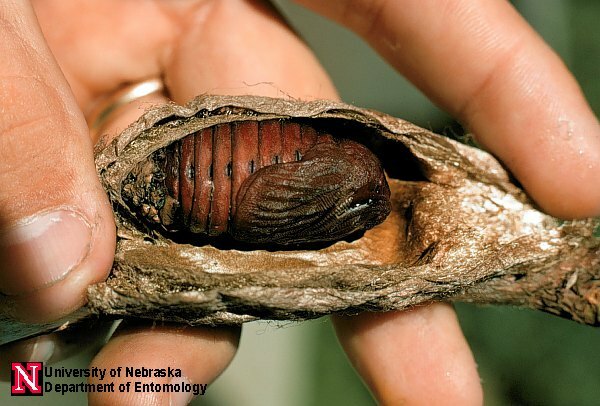 Here is a picture (by Dave Keith, U.N.) of what one would look like if you cut open its cocoon (because I most certainly will NOT be doing that!). I am keeping the cocoons in the cold part of my basement (they need to overwinter in cold temps) and occasionally spritzing them with water (so they don’t dry out). Everything I have read about emerging time has been pretty vague, saying spring to early summer, so I will have to keep a close eye on them. 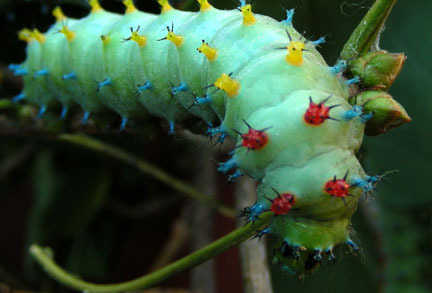 Hopefully, I will have some great photos of cecropia moths to share then! p.s. : I will not be raising them again…too time consuming for me. 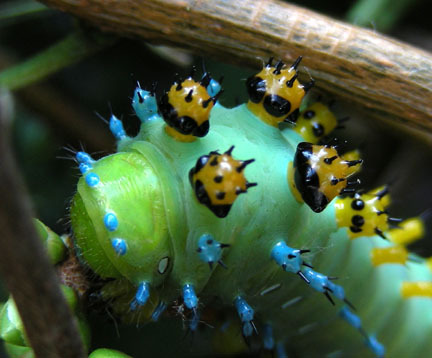 Cecropia Moth Caterpillar Enemy Number 1: Yellow Jackets! 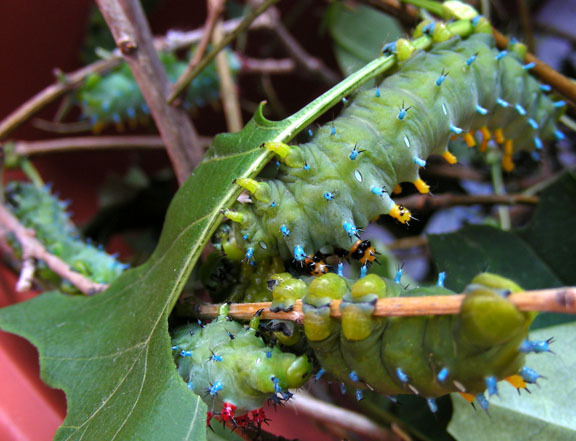 Something has been chomping on my outdoor (recently freed) cecropia caterpillars. At first, I thought it must be the marauding packs of house sparrows, which seem to pick the yard clean of anything that moves. Yesterday, however, I discovered the true fiend: yellow jacket wasps (insert dramatic music crescendo here). They will search out the feeding caterpillars and fly in and nip off a bite. It looks like they start on the knobs and then start taking chunks out of the meaty bits. Now, having worked as a naturalist and also as a volunteer at a wildlife rehabilitation center, my “ick” reflex is pretty strong (try having a sick woodchuck sneeze green snot all over YOUR face…) but being slowly eaten alive by wasps…ICK!!! Not a pretty way to go. 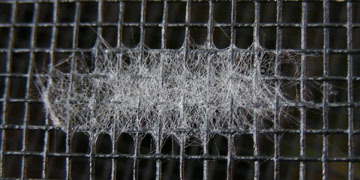 And the caterpillar ooze (oh, sure, that’s the scientific name…just as “thingy” and “whatchamahoozit” are valid, too) is a horrible black, tarry mess. Still, I am hoping some survive, as there is just no way to protect these wild caterpillars from everything out to get them. I still have about twelve I am continuing to raise inside, so keep your fingers crossed. —As a side note, one year when I was in high school, a yellow jacket queen made her nest up against one of the windows in my room that was missing a screen and was always covered up by curtains (it looked directly out and into the neighbors house less than four feet away). In a few months, it became quite a large nest and I had an actual cross-section view into it whenever I lifted the cutains…very cool! Wish I had taken some pictures back then. —I’m just glad the nest wasn’t as big as these monster ones. Look at the one in the car! 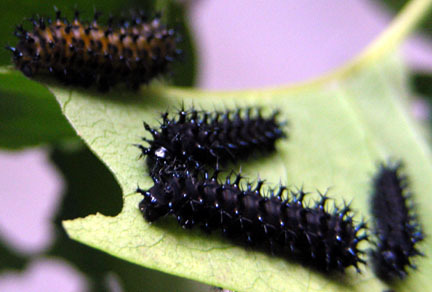 Just so you know: caterpillars are high maintenance pets! When they were little, all I had to do was put in some fresh branches and change the paper towels every few days. Now, I am lucky if I don’t have to put in MORE branches 12 hours later in the day. 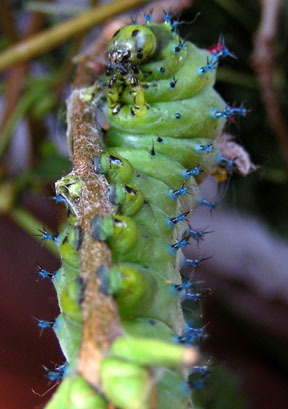 (The caterpillars are up to about 4 inches in length). It’s a good thing that so many wild caterpillars get eaten or we would have denuded trees! Also, as the caterpillars grow so does the size of their frass (poop). 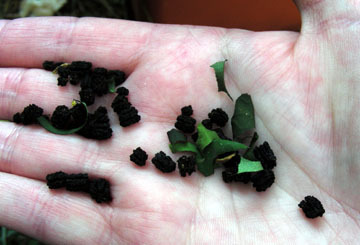 And it’s kinda stinky, which surprised me as it’s just processed plant materials… I wonder if the frass is good to fertilize the garden? 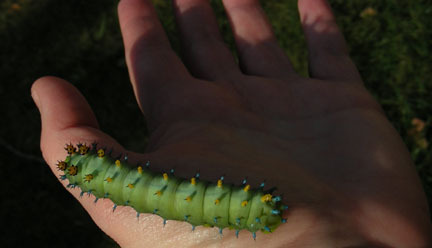 I have had fun observing my cecropia moth caterpillars grow but I am ready to let them go. Tonight I set free about 10 of them onto our backyard lilac bush. Sadly, many of the ones I let go last week have been eaten but such is they way of things. One fell off (I am guessing) and was found on the ground half eaten by ants. One thing you must have to raise these guys: patience. You cannot simply pluck them off a branch, as they will hold onto a branch until their little claspers break off (no, I have not done this, but trust me, it can happen). You have to coax them onto another branch or your hand to move them. And they are not very speedy. A hungry caterpillar can be motivated to move toward a fresh leaf, though. I have no idea how they detect their food source (smell or some version of it??) 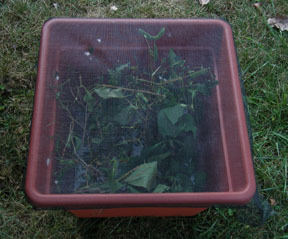 but they can locate fresh leaves from across one side of the cage and will move rapidly toward them. 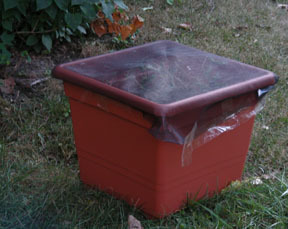 Here are some pictures of the cage I came up with: a large, plastic flower pot covered with flexible screen mesh. Also, be sure not to disturb them when they are resting and getting ready to shed their skin. They will jerk their body from side to side if you (or another caterpillar) accidentally bump them. You might be able to see the silk pad they use to anchor themselves to a branch (or the top of the cage, in my case) when they are in this resting phase. They sometimes hold themselves in what I like to call the Mr. Burns pose (a la The Simpsons), with their head extended back and legs curled up together. It’s interesting how many variations there are in their color and shading as they grow bigger. The younger ones are a deep leaf green and then turn yellow green to milky green. Then their knob (hur hur) colors change from red to orange. Last month, a presenter we had at the library brought in some cecropia moths she has been rearing. They had mated and the female laid eggs all over the cage. The woman insisted I take some eggs home with me (I think she just wanted to thin out the herd…). Eventually, i will need to either free them outside so they can pupate or find a really big cage for them to make their cocoons in and then stick it out in the garage for the winter. I think I’ll at least keep one or two (assuming I can get them this far) so I can see them emerge next year. The moths are so big and beautiful!